The last performance of our run here in Seoul was yesterday afternoon, so we are officially done with our engagment here and are about to head back home to Portland. What an incredible experience this has been. From the sights and sounds of a foreign city to the culture, food, currency and most importantly, the people we've met and worked with, this journey is one that none of us will forget quickly. I think this tour has been exciting and a huge success on many levels for many people, not only for us at OBT. Maybe we'll be back someday to continue to build upon this bridge that has been forged. 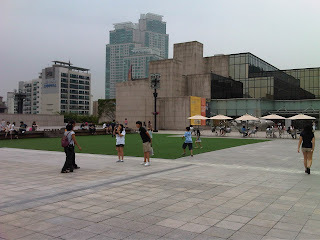 Goodbye for now, Seoul Arts Center! Monday was our day off here in Seoul, so in preparation a group of us went out dancing on Sunday night after the show to a club called "Noise Basement 2," and that's basically what it was. It was a fun night, but I got in around 4 am, so I chose to rest on my free day by doing some shopping and not making too many plans. I had dinner with some friends Monday night at place called "Blue Ketchup. The first thing I noticed upon walking in was that it was very dark and there was dance music playing. Then, I noticed the big screen all around the room with images being projected on it. The images varied from geometric shapes to, my favorite, ocean waves. It was back to work on Tuesday with a little bit of Nutcracker rehearsal and some Sleeping Beauty rehearsal for the ladies and Brett in preparation for our performance with the Oregon Symphony at the Waterfront later this month. I decided to go to Myeong-Dong between rehearsal and the evening show. On the ride there I noticed this awesome fountain right near the Seoul Arts Centre where we are performing. All the tickets for the Tuesday show (and tonight's show too, I think) were bought by 1 company for their employees, so the audience was great. Applause erupted half way through snow, something that hasn't happened in my memory of Nutcracker. After the show a group went out for what was supposed to be a 30 minute picture session with the crowd, but they were pulled out after 10 minutes because they were being surrounded and it seemed like the situation might not be entirely safe. Tonight we are doing and autograph signing after the show, so we'll see if that is a bit more successful. The audiences have all been fantastic here, but something it has taken some getting used to is that instead of applauding here after the curtain comes in, they stop clapping until the curtain goes back out and the performers walk forward and actually take their bow. My first Drosselemeier here I went out on stage for my bow with the kids after Act 1 and felt like I was standing there with egg on my face because about 3 people were clapping when the curtain went back out until I walked forward with the kids and then the audience gave us a pretty enthusiastic round of applause. I'm not dancing in the next 3 shows here (2 Drosselmeiers and a show off), and since I have no rehearsal today I'm going to skip class and go exploring/shopping with Gavin Larsen. Well, today was our last day before opening night. It's been a little weird having such a limited amount of stage time. Yesterday evening was our first rehearsal on stage, tonight we had our dress rehearsal, and tomorrow afternoon we open! Dress rehearsal went fairly smoothly, all things considered, and I feel pretty confident in the quality of show we'll give tomorrow. I think many of us are uncertain of how we'll be received because we are quite different from the russian trained dancers they are used to seeing. I'm still very much in awe of the theater we are performing in. They stage is huge, and while the house is quite large, it still has a very intimate feeling to it. Also, I'm a sucker for any theater with a chandelier in it. Here are some shots from the back of the stage, back of the house, and of the chandelier. Lastly, one of my favorite things about Nutcracker is being transformed into a character through make-up, and especially the time between when I get my make-up done and when I put my costume on (my make-up call is and hour before curtain for this run, and my costume is very hot, so I usually don't get dressed until 15 before curtain). I feel so funny wandering around backstage looking like an old man from the neck up, and my 24 year old self from the neck down. Here's Javier as Grandfather and me as Drosselmeier killing time before putting on our costumes. On a non-dance related note, the cicadas here are going crazy. This is the loudest I've ever heard cicadas be. Also, after many years of visiting family back in Pittsburgh and Ohio and hearing the noise constantly, I finally got to see what one looked like. Brian and I were visited by one outside our room this morning so I snapped a shot. They are so weird looking. Anyone recognize those wings? Alright, I think that's all I've got for today. It's hard to believe it's only the second day of rehearsals, it feels a bit like I've been here for a couple weeks. We had our first rehearsal on stage tonight, which I hear is very disorienting (I haven't rehearsed on stage yet, so I can't speak from experience). It's very deep, but about as wide as it is at home. Maia got her first taste of the being pulled on the winch (or as we call it "the wench"), but because it wasn't her cast rehearsing she ended up trying it in her street clothes with one pointe shoe on. I couldn't help but snap a picture. Tomorrow holds an Act I rehearsal on stage with the kids and a full dress in the evening (and hopefully something more interesting to write about). It's been a busy couple of days here. The weather is warm and humid (88% today), and there hasn't been much blue sky, but it's so amazing being here. Wednesday was our Free Day. Some of us took the bus the has been chartered for us to class. It was a real kick to watch it drive up to our hotel with a huge nutcracker ad on it's side. We had an optional class in one of the studios in the theater complex. The studio is much wider than we are used to, but not quite as deep. The floor is pretty slick, even with rosin, so we've been trying to dance as full out as we can without slipping. 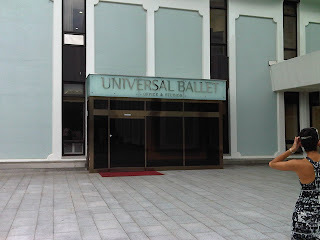 After class a group of us took the subway first to the Universal Ballet's studios to try and contact an old friend of Brett's, and then to Insa-Dong. 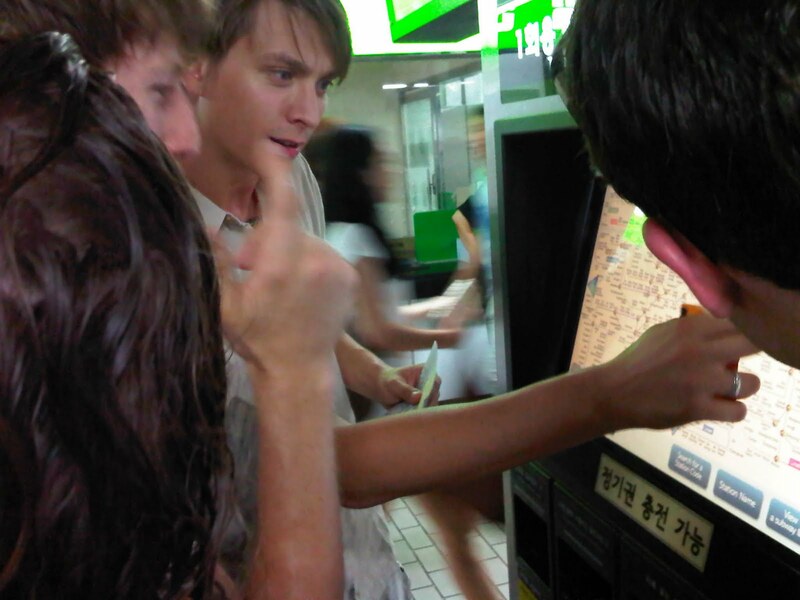 Trying to figure out how to buy subway tickets (even with the machine on the English language setting) was somewhat tricky. 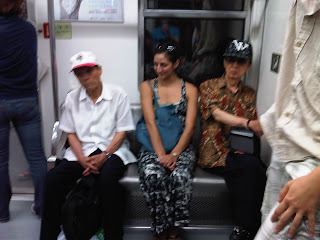 Martina made from friends on the subway. We found the studios, but Brett's friend wasn't there (I think they are on a break right now). However, another company member was there and called Brett's friend and they were eventually able to meet up. Oh the small world of ballet. Yesterday (it's Friday here) we had our first day of rehearsals with the kids. They are sooooo great. They are incredibly smart and well trained, and just really delightful to work with. I've already made friends with the boy who is playing the Prince/Nephew, which I'm really happy about since I'm doing quite a few Drosselmeiers while I'm here. I'm really impressed with the Port de Bras (carriage of the arms) of the kids, especially the boys. On the break I checked out the plaza outside of the entrance to the theater (we've been entering through the stage door) and it's really beautiful up there. There are restaurants, art exhibits, and even a little astro-turf area for playing. Because we have 2 Sugar Plums out right now, we've hired Maia Mackateli (you may remember her from Dance United 2, she's from Dutch National Ballet) to dance with us. Here she is rehearsing with Chauncey and Christopher. Finally, here are some shots of the AMAZINGLY huge theater. I still can't get over the size of the both the onstage and off stage areas. Well, we've all arrived safe and sound in Seoul. The hotel is great and I'll post some pictures of that later today. It was an uneventful second flight, but I have a feeling I'll never really consider another flight to ever really be "eventful" again with that first one as my basis for comparison. At least the complimentary slippers helped a little bit. I'll do my best to keep you all updated, but there's not telling how busy I'll be since we'll be starting Sleeping Beauty rehearsals while here. Greetings from Alaska! It seems that when we tour with The Nutcracker we just can't stay away from Anchorage, AK. Due to an unscheduled in-flight fight, we are currently making a brief stop to allow police to help a belligerent shirt-less man de-plane. We are all safe, but pretty shaken up. We're sitting on the plane until they are able to refuel and get statements from those involved in the altercation. In the meantime we are getting a beverage service and a snack. 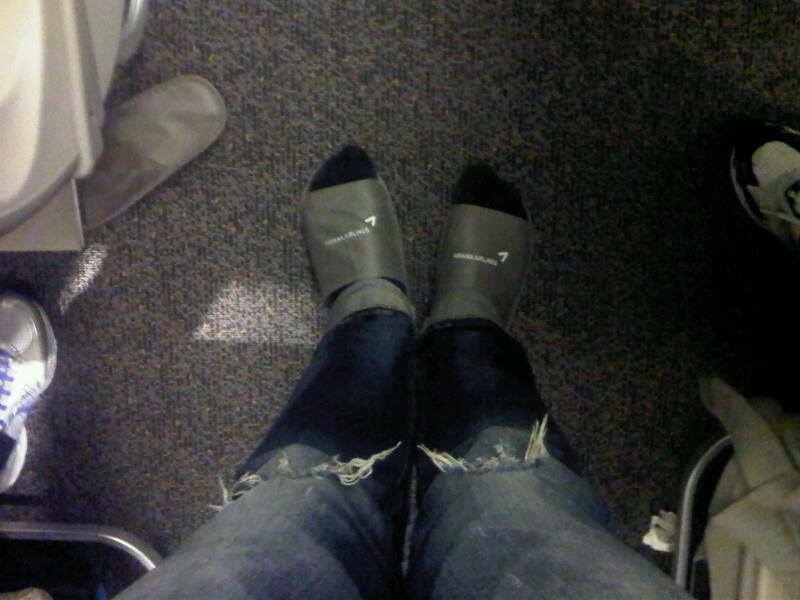 Well, we have all successfully checked in and made it to the gate. They just announced that our flight is delayed, but haven't announced a new departure time yet. It's weird to think that in 11 hours from take-off we will be in another country and it will be tomorrow night. Hopefully the next time I have anything interesting to say I will be writing from Korea. Stage 2: Checking In - Coming soon. 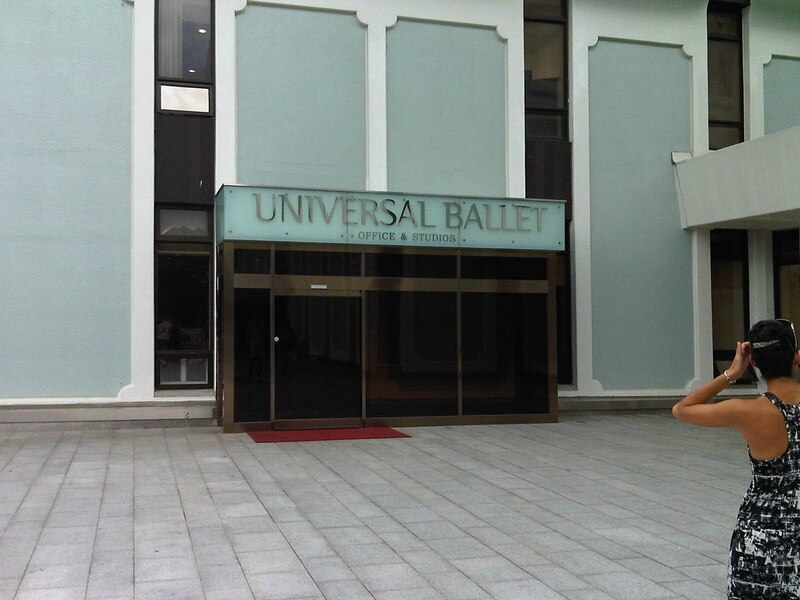 More to come as we venture across the Pacific to bring The Nutcracker to Korea. 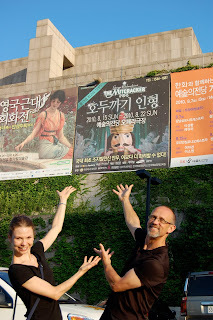 Big excitement, lots of preparations, and finally Kevin, Thyra and I arrived in Seoul yesterday to finish coaching the cast of Korean children for OBT's performances of Nutcracker here, set to open later this week. 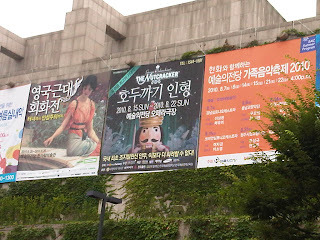 Entering the lobby of the Seoul Art Center, where we are to perform, we see posters for all the upcoming shows and looked eagerly for OBT's images and logo. But all we could find was.... Cinderella On Ice?? HUH? Has there been some mistake? Have we been booted in favor of an ICE BALLET?!? But luckily, before panic set in, we saw the real advertisement outside--- a larger-than-life banner for OUR performances, hung on the side of the building for all of Seoul to see (and buy tickets for). Phew!